When you’re on holiday in Byron Bay, plan to put on your hiking boots and try out any of the excellent trails in Byron Bay. But some of these hikes might require a couple of hours or even a half day to finish, so you might want to pack one of these delicious snacks with you. Make them ahead of your holiday, and bring them along to eat and enjoy while you’re out and about doing fun activities in Byron Bay. Spoon 2 tbsp desiccated coconut into a bowl and then toss the balls in the mix to cover completely. Refrigerate. These yummy balls will keep for a couple of weeks, stored in a plastic bag or airtight container. Add the beef to the marinade, a few slices at a time, stirring well to coat each slice with the marinade. Cover and refrigerate for 6 to 8 hours. Preheat the oven to 200 C°. Set a large wire rack on each of 3 large rimmed baking sheets. Remove the beef from the marinade and pat dry with paper towels. Arrange the beef on the racks, leaving 1/4 inch between slices. Sprinkle with coarsely ground black pepper. Bake for about 4 hours, until the jerky is firm and almost completely dry, but still chewy. Let cool completely on the racks before serving. First grease a 20 x 20 cm baking tin with the oil. Combine the brown rice syrup and vanilla together into a small bowl. Heat in microwave for 30 seconds or cook on stove in a small pot until slightly warm and a little thinner in texture. Pour onto dry ingredients. Press the mixture into the greased pan. Freeze for about 45 minutes, until hardened. Cut slices as big or small as you like. Store in the fridge. Chuck your scroggin into a ziplock bag (best double up the bag in case of breakages), and you are ready to go! Spray an 20×20 cm baking tin with non-stick cooking spray; set aside. Place the dates in a food processor and pulse until finely chopped. Combine the pureed dates with the cereal, oats, peanuts, flaxseed, cinnamon and salt in a large bowl. Combine the peanut butter and brown rice syrup in a small saucepan over medium heat, stirring until melted and completely blended. Remove from heat and stir in the vanilla extract. Pour the peanut butter mixture over the oat mixture and stir until well combined. Turn the mixture into the prepared tin and press firmly to pack the mixture into the tin. Let the mixture sit until completely cool and set, at least 1 hour. Cut into bars, then wrap individually in plastic wrap and store in the refrigerator. 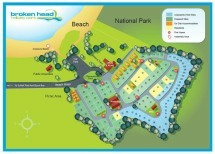 Come and stay at Broken Head Holiday Park for your Byron Bay holiday. If you enjoy hiking, then it just makes sense to book a beach cabin, beach shack or powered or non powered campsite. You’ll have access to our excellent camp kitchen to make any of these yummy snacks (if you didn’t make them ahead of time), and an affordable spot to make your base while you’re on holiday. What are waiting for? Book your stay soon!